Through a series of public workshops participants had traced and depicted both policing and individual experiences at specific nodes and hubs of transnational mobility and migration in and around the places they live in or encounter on route. Every node is part of a network shaped by transnational connections and specific zones that modulate the exchanges between it and the rest of the world. At such nodes, the effects of migratory movements and the globalized exchange of goods and services become visible, and there political changes can be found immediately looming. 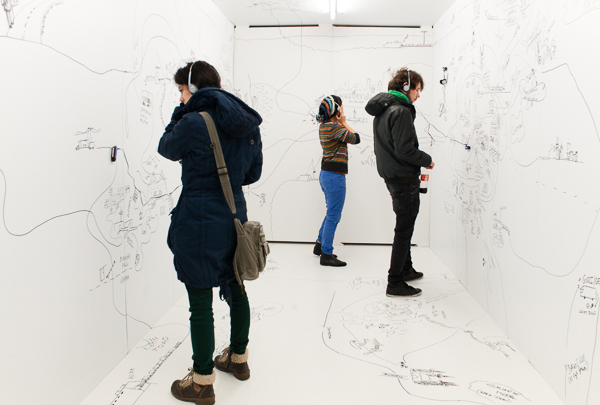 Participants had been asked to co-develop an extensive two- and partly three-dimensional spatial cartography, augmented with various sorts of texts, comic-style drawings, photos and narrative audio tracks. Based on their own experience, the experience of friends and relatives, and knowledge gained from fine arts, science and mass media a striding geographic and spatial cartography evolved, a walkable globe with corners and edges, permeated by a network of paths, with the respective place of the workshop as its centre.